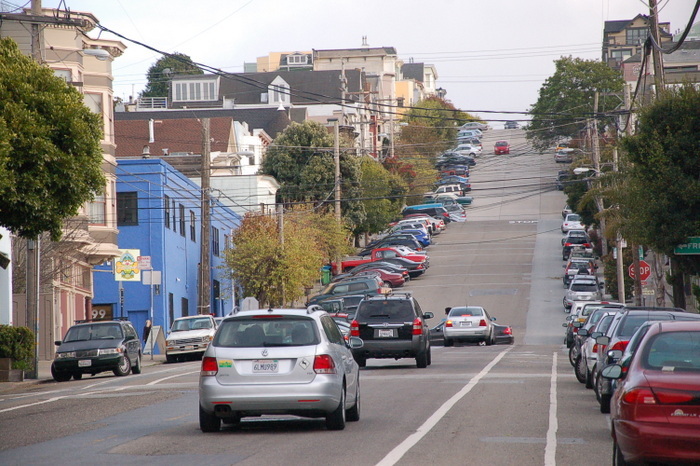 The SFMTA has given up on its neighborhood-scale plans to install parking meters in the Dogpatch and Portrero Hill, while parking meter approvals in the northeast Mission move forward at a snail’s pace. After two years of tangling with the city, the defenders of dysfunctional free parking have effectively caused a huge setback for progressive transportation policy — meaning more traffic and slower transit in the future. Hooray for San Francisco. As for the parking-crunched northeast Mission, the first of the three neighborhoods where the SFMTA initiated its drawn-out parking outreach, only a small fraction of the planned meters are moving through the approval process — nearly half a year behind the schedule presented at a public meeting in March [PDF]. The initial meters were delayed even further by meter opponents who protested the wrong hearing ordinance. By no means, however, does the anti-meter crowd appear to be pleased with the way SFMTA is scaling back its plans. Free parking activists like Eastern Neighborhoods United Front leader Mari Eliza are still attacking the SFMTA in Potrero Hill. Residents like Eliza want a permit system so they can park for free, and employers want a permit system so their employees can park for free. This is par for the course. ENUF and its ilk have made it clear that they won’t be satisfied until the SFMTA guarantees they won’t have to pay to park on the street, basically asserting free parking as a fundamental right. The SFMTA’s first move to quell anti-meter sentiment in these neighborhoods was to remove the SFPark brand from the plans, since opponents were attacking the program as a federally-funded imposition. This appears to have only emboldened the opponents of parking reform, however. Meanwhile, former Potrero Boosters president and supervisor hopeful Tony Kelly continues to promote the idea of exempting car-owning residents from meter payment — an absurd concept that would negate the purpose of metering spaces to ensure turnover. Residents also continue to call for the expansion of the RPP program to limit the number of commuters parking on streets, but it’s up to residents themselves to initiate RPP petitions. That would totally count, murphs – but there has been zero indication from MTA that that would happen. I think that would be good policy but probably not good politics. I’m just going to take a wild guess that the people most vociferously opposing metering don’t view Muni service in the area as something that’s relevant to them. This article has a fatal flaw: It equates parking meters with progressive transportation policy. One does not necessarily beget the other. In fact, installing parking meters willy-nilly does absolutely nothing to improve transportation but can have detrimental effects to adjacent land users. Can parking meters be an integral part of a comprehensive strategy to improve transportation? Absolutely. Does simply installing a set of parking meters solve everyone’s problems? Absolutely not. In fact, parking meters are absolutely useless if useful alternatives to private automobiles are not available. Where is the improved Muni service, bike sharing, and car sharing? Without those things, the people of Potrero Hill and Dogpatch are not going to give up their cars. Without those things, the people of Potrero Hill and Dogpatch are not going to give up their cars. Does this imply that with those things – the people of Potrero Hill and Dogpatch are going to give up their cars? If not, you are simply throwing out a logical fallacy. Go Fish.. If the streets weren’t clogged with traffic and double parked vehicles, MUNI would benefit tremendously! I mean really; aside from breakdowns, the biggest cause for delay is TRAFFIC, and because of traffic, traffic lights! It all works together! what missing for me in all this is an honest assessment of the economic impacts of unavailable street parking in Showplace Square & Dogpatch. What I see is a simple tradeoff that prioritizes free unmanaged (all day) vehicle storage (largely for commuters) vs parking management programs designed to provide available parking to support neighborhood small businesses that rely on prospective customers being able to park. It basically goes to the question of what kind of neighborhood do we want? The status quo or one populated by a variety of small businesses that cater to residents, daytime workers and visitors?